To find you the best crib mattresses of the year, our hands-on tests and reviews put over 15 crib mattresses to the test. We considered size, crib fitment, dual firmness, emissions standards, venting, comfort, price, and longevity. For more details on how we evaluated the different types of mattresses, see the bottom of this article! Otherwise, below we list our top 5 crib mattresses, followed by in-depth reviews of about 10 different options. It can be tough to find the perfect baby and toddler crib mattress without breaking the bank. Parents have become more aware of issues like safety and emissions of volatile organic compounds (VOCs). Even a decade ago it was common for mattresses to contain formaldehyde, benzene, toluene, acetone, and a variety of toxic flame retardants. More recently, common VOCs include phenol, neodecanoic acid, and linalool, though many crib mattress manufacturers have done a good job making natural and organic versions of their popular mattresses. We pulled together a ton of data, reviews, and product tests to put together this list of the best crib mattresses of 2019. Be sure to also check out our convertible crib reviews. Here are the Best Crib Mattresses of 2019! 1. Newton Wovenaire Crib Mattress. This top-rated Wovenaire crib mattress has a lot of accolades. It is recommended by Dr. Sears, made right here in the USA, has won several awards like the JPMA innovation award, and is Greenguard GOLD Certified. It is a little different from others on this list because it doesn't have two sides (one for baby, one for toddler mattress). Instead, they made it somewhere halfway between firm and soft, so you never have to flip it over. We were worried that it might be too soft for infant and not soft enough for a toddler, but honestly, they did an excellent job finding the perfect mattress firmness to use with both infants and toddlers. They likely made it this way because they do not use foam - foam would have made it easier to put a different density foam on one side than the other. Instead, they use what they call "90% air" polymer material, which is just a fancy way of saying it's filled with air-puffed plastic or polyester. That makes the mattress lightweight and avoids some of the harmful chemicals that tend to be in crib mattress foam (you should generally avoid urethane or polyurethane foam mattresses). They do point out that the inner mattress material is a food-grade polymer, which I guess is good in case your baby decides to store food in it. Joking aside, this is an excellent mattress, and in our testing, we found it comfortable, a great fit for both of our test cribs, odor-free (no off-gassing), breathable (we tested it ourselves! ), and super comfortable. There's a lot of great stuff to love about this Wovenaire crib mattress, and a lot of bad stuff is missing. Like latex, springs, foam, allergens, and glues. The mattress comes with a zippered cover that worked well for protecting the mattress, though it could have been a bit softer to the touch. Of course, after the first few months you'll be using a sheet over it, so that shouldn't matter much. Why no sheet for the first several months? Well, Newton recommends using the mattress only, no extra protector or sheets, at least for the first few months. Why? Because the cover is super breathable and lowers the risk of suffocation. The edges are nicely squared so that it fit snugly into our test crib, the mattress core and cover are both highly breathable which is good for baby safety, they claim it is entirely recyclable (though I challenge you to get it into your recycling bin), and the cover and the mattress itself are washable. The cover can be machine washed and dried (on tumble or low), and if you remove the cover of the mattress core, you can actually spot-clean the core or even wash it in the shower or bath! But all of this comes at quite a price, with this mattress being one of the most expensive on the list (usually around $299). Replacement (or extra) covers for the Newton Wovenaire are pricey too at around $80, but we think it's well worth it. Interested? You can check out this Newton Crib Mattress here. 2. Moonlight Slumber Little Dreamer Crib Mattress. This is a great crib mattress that is made right here in the U.S.A. and has some great low VOC features, squared corners, a long excluded chemical list, a waterproof and seamless cover, dual firmness, and it's hypoallergenic. In our testing, this mattress fits our (DaVinci) crib like a glove, and the squared corners are awesome, filling all the extra space. 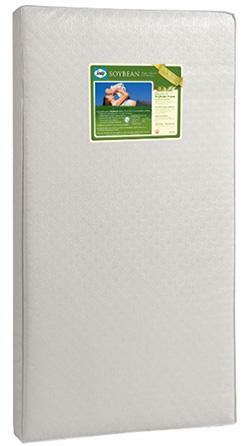 It is a Greenguard GOLD certified crib mattress, and also CertiPUR-US certified for low VOC emissions. As far as we could tell it has a great build quality, and the seamless edges and waterproof cover were a nice touch. The cover itself is decently soft and seems like good quality, and it's infused with plant oils for some nice softness. It certainly didn't seem like it would dry out or crack any time soon. At 8 pounds it's about the same weight as the above 2 options, making for easy sheet and mattress pad changing. The nicely squared corners also make sheet changes easier, and sheets are more likely to actually stay on the mattress over time. It also has an antimicrobial coating on the fabric cover which is a nice touch, and the cover is water, stain and odor resistant as well. Finally, they also added extra firm edges so that the mattress won't sag at the edges, like when a toddler stands on the edge (which they will, and likely also jump!). The Moonlight Slumber little dreamer is about the same price as the Colgate (below), coming in around $199. We found that the firmness balance between the infant and toddler sides was really nice; the infant side was super firm, and the toddler side was moderately firm/soft. The version we purchased didn't have any labels showing which side was the infant side and which was the toddler side. If you can't tell from pushing your hand in and feeling which side is the firmer infant side, the one we tested had words printed on one side (the infant side) and the other side was blank (the toddler side). We also liked that its seams were basically non-existent, and rather than using spray-on fire retardant chemicals, it uses an innovative woven fire barrier. The cons? In our testing, we found the smell (off-gassing) a bit stronger than the others (other than the Simmons, below), but within a couple days it was either gone or unnoticeable. Overall, the build quality seems quite good, but since it's relatively new to the market it's hard to predict the durability and longevity of this particular mattress. Interested? You can check out this Moonlight Slumber Crib Mattress here. 3. Babyletto Pure Core Non-Toxic Crib Mattress. About $199. This Babyletto Pure Crib Mattress is relatively new to the baby mattress market, and it is the perfect pair for our top-rated Babyletto cribs. This mattress has so many great things going for it. First, it is dual-sided, with a nice firm newborn side and a relatively soft toddler side. Second, it is hypoallergenic and dust mite and allergen resistant. Third, the core is non-toxic and does not contain urethane; instead, it uses a polyester core like the Newton Wovenaire (above). The core also doesn't contain soy, vinyl, PVC, chemical flame retardants, dyes, allergens, phthalates, PFCs, synthetic latex, or other high VOC (off-gassing) materials. And that core can be recycled - so if you chopped it up and squeezed it into your recycling bin that's dream can become a reality! Above the core there is a softer batting layer that is made of modacrylic fiber and polyester. What's modacrylic fiber? It's a synthetic acrylic fiber that is hypoallergenic, mildew-resistant, and highly durable. Fourth, it has an awesome cotton cover with a vinyl-free waterproof liner on its underside; that cover zips on and off easily, and can be machine washed. They call this the "hybrid" cover since it has a soft cotton top and waterproof liner bottom. Finally, we thought the review was comfortable and fit amazingly well into our Babyletto and DaVinci cribs. Snug as a bug, without any gaps at the sides or corners. And the two sides were nicely structured - it was very firm on the newborn side, and the other side was the perfect softness for a toddler. Cons? Well, a couple minor things. First, we found the zipper on the cover lower quality than we would have liked, and we thought for sure that it will break at some point soon. It hasn't broken yet, but we'll update after a few more launderings. Second, after machine washing the cover it shrank quite a bit and made it a pain to stretch back onto the mattress. So overall this is an excellent crib mattress with only a few downfalls worth considering. At this price, we think it's worth it for the non-toxic materials, dual-sized construction, waterproof cover, and excellent fit. Interested? You can check out this Babyletto Pure Crib Mattress here. 4. 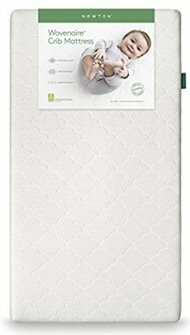 Emily Natural Crib Mattress with Organic Batting and Cover. About $250. Looking for a high-quality natural crib mattress with certified organic materials, Greenguard GOLD certification, no urethane or polyurethane core, and made here in the USA? This is probably the perfect mattress for you! We first tested this mattress in mid-2018 and we were very impressed with its quality, features, and comfort. Made right here in the USA, this all-natural crib mattress leaves very little to be desired. What we really loved about it is that it's like a real grown-up mattress - no vinyl cover to stop ventilation and comfort, real stitched seams, and a pattern stitching on the GOTS organic cotton quilted cover with organic eco-wool sewn in underneath. It has little needle perforations so the mattress can breathe, and you combine that with the wool under-layer and you have a great combination for keeping things cool in the summer and warm in the winter. Under this plush and comfortable cover is a really high-quality mattress core with 150 coil innersprings, a supportive edge (just like a mattress for larger beds! ), and organic cotton batting (not urethane or polyurethane foam). Our $900 queen size mattress at home isn't even that nice, we might need to replace it with one of the other great mattresses made by this company (My Green Mattress)! The mattress comes shipped flat in a large cardboard box, which we prefer relative to all the waiting before you can use most rolled-up mattresses. Out of the box, we didn't detect any odor at all, which jives with the fact that it's Greenguard GOLD certified for very low chemical emissions. When we put it into the crib, it fit snugly into the edges and corners. And it was firm enough for a baby but not too firm for a toddler, it's like the perfect firmness (very similar to the Newton Wovenaire) for comfort at all ages. And the innerspring construction means that it can be quite fun for a toddler learning to jump in their crib! (for better or worse!) The mattress is double-sided (not dual-firmness), meaning it does not have different firmness on each side, but rather gives you the flexibility to flip the mattress over every few months. We highly recommend flipping any mattress every few months to prevent sagging and dips. So we felt really good about this mattress, and after some longer-term testing it might work its way up higher on this list! The only negative we found in our hands-on review was that you need to purchase a separate mattress cover. You do not want to have an accident on this beautiful mattress - so that's another $35 or so for a good organic crib mattress cover/pad (one of our favorite covers is here). Interested? You can check out this Emily Natural Crib Mattress here. 5. Colgate Eco Classica III Crib Mattress. This top-rated U.S. made crib mattress is from one of the best companies in the crib mattress market. Colgate has been making crib mattresses since 1955, and they are a name you can trust for high-quality and minimal compromise. This is one of their eco-friendlier mattresses, with a certified organic cover (not vinyl), and very low VOC emissions that conform to CertiPUR-US standards. It is a foam core, with one firm infant side and one softer toddler side. This Colgate Eco Classica III is called dual-firmness (more details on that at the bottom of this article), which is a nice way to avoid buying a second mattress when your baby turns into a toddler. In our hands-on testing, we found this crib mattress to be very well constructed, with a soft high-quality organic cotton cover, a very firm infant side, a moderately soft toddler side, and no bad odors even out of the box. Note that the side that serves as a toddler crib mattress isn't super soft, which we prefer since we want to maintain support during sleep and make it easier for toddlers to change positions during the night; when the mattress is too soft, it absorbs too much elbow and hand, making it difficult for toddlers to roll around while sleeping. We also found this mattress to be very lightweight, mostly because it's a urethane foam core, which made it very easy to pull in/out of the crib for sheet and pad changes. This makes things much easier than with a mattress with metal springs. Yes, they still make innerspring crib mattresses (see the Simmons Kids option below, or the Emily option above, in case you're looking for one). It also has squared edges, fitting snugly into standard crib without gaps, a nice 6" thickness, and it has excellent reviews for longevity. We put it through 2 weeks of testing and it was truly a fantastic crib mattress. This is the second year in a row that it's appearing near the top of our best crib mattresses list, but you will pay a bit extra for the quality and eco-friendliness. Cons? The Colgate Eco Classica III is not a fully organic mattress, and we don't like the fact that it uses a urethane core, so if that's important to you then check out the Newton Crib Mattress, Emily Crib Mattress, or the Naturepedic NoCompromise options. Interested? You can check out this Colgate Crib Mattress here. 6. Naturepedic NoCompromise Crib Mattress. We get a lot of emails from parents asking whether the Colgate or Naturepedic mattress is the better option for their baby. We always answer that it really depends on what's important for you. If you're willing to spend an extra $100 for a fully organic mattress that is quite similar in other regards to the Colgate option, then you should definitely go for it. This U.S. made organic mattress is made with high-quality materials, has dual firmness (one baby side and one softer toddler mattress side), and coil core construction with border rods to prevent edge sagging. Coils are expensive to integrate into mattresses, and this has 150 of them, plus organic cotton padding and cover. This means it is less likely to get lumpy or saggy areas and maintains good support over the course of several years. Most crib mattresses without coils will develop sunken areas unless they are frequently flipped and your baby sleeps in different areas over time. This mattress meets Greenguard and GOTS certifications, is made with seamless edges, has squared corners, and excellent reviews. It is also marketed as hypoallergenic. In our testing, we loved the waterproof organic cotton cover that was extremely easy to clean, it was basically odorless, and we thought it fit very snugly in our test (DaVinci) crib. The construction quality was overall very high, and we anticipate this having great longevity. Inside the cover, the mattress tag indicates that it is made with organic fiber batting, non-GMO PLA batting (polylactide batting), and polyethylene foam (this is for water-proofing). There are two cons, however. First, the mattress is about 7 pounds heavier than the Colgate option above, making it a bit more difficult to pull in/out of the crib for sheet or pad changes. Second, it is about $100 more expensive than the Colgate or Moonlight Slumber options. However, for parents looking for a fully organic option without VOC emissions from chemical content, this is a great option as it contains no latex, soy, GMOs, vinyl/PVC, formaldehyde, flame retardants, PFCs, phthalates, or polyurethane foam. After using this mattress for 2 years now, we are happy to say that it has held up quite well. There is some sagging in our baby's favorite sleeping spots, which is pretty common over the course of a couple years. It's proven itself to be reliable, comfortable, and safe. Highly recommended! Interested? 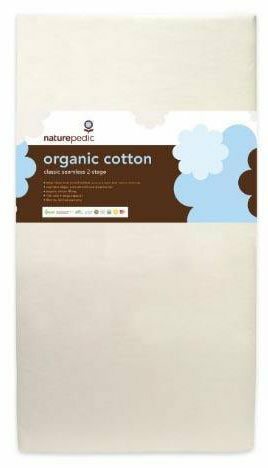 You can check out this Naturepedic Crib Mattress here! 7. Safety 1st Transitions Crib Mattress. There are several Safety 1st crib mattresses available on the market, including the Peaceful Lullabies, Sweet Dreams, and Heavenly Dreams models. We've tested a couple of those but they didn't make it onto this list for various reasons - for instance, our sample of the Heavenly Dreams mattresses had a cracked vinyl cover within a couple months, and was a bit too small for our test cribs (leaving gaps on the sides). But this Transitions crib mattress made it through our tests with pretty good results. Let's start with the basic features. This is a dual-firmness mattress with one infant and one toddler firmness side. It uses a PVC-free water resistant cover that is made of PEVA instead of typical vinyl; PEVA is a form of vinyl that is non-chlorinated (and thus doesn't use PVC - the C in PVC is chlorine, by the way). PEVA is considered less toxic than PVC, and does not contain phthalates. In addition to its dual-firmness and the use of a non-vinyl cover, it uses a thermo-bonded fiber core that is made from polyester rather than foam, very similar to other options on this list (like the Newton Wovenaire). It's also a Greenguard Gold Certified mattress, meaning that is has low chemical emissions (off-gassing). In our testing we really liked this mattress: out of the box it had no overwhelming chemical smell, which was reassuring. It also had a really nice firmness on the infant side, and a comfortable semi-firm toddler side that was a happy medium between comfort and support. The mattress corners were nice and squared off so they had a good sharp 90-degree angle, making them fill in all the corner gaps of our test cribs (a Babyletto, a Delta, and a DaVinci). The cover was water resistant and easy to wipe clean, and didn't have the crinkly sound and feel when pressure was placed on it. So that was all pretty great! It's not an organic cover, and the fill is not organic either, so keep that in mind if you're looking specifically for an organic crib mattress rather than one that is only certified for low emissions. The mattress thickness came in at just over 5", and we didn't have any issues with sagging, lumps, or otherwise uneven support. So overall we were impressed by this mattress, with one caveat: it didn't fit very well in all of our cribs. It was interesting because it fit very nicely into the Delta crib, but it was simply too long for our Babyletto and DaVinci cribs. We got it to squeeze in, but it left the mattress a little wavy because it was under some pressure from the ends pushing up hard against the crib walls. This also made it much more of a chore to change the sheets and waterproof cover (yes, we still use a cover even on water resistant mattresses!) because we couldn't easily pull up the corners to do the sheet swap. At this price point of only about $80, we think this is a great mattress that combines low emissions with dual-firmness and a good build quality. Just be prepared for a tight fit for some cribs. Interested? You can check out this Safety 1st Crib Mattress here! 8. 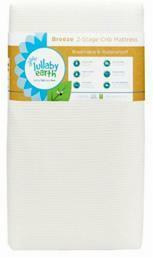 Lullaby Earth Breeze Crib Mattress. The Lullaby Earth series of mattresses is relatively new to the crib mattress arena, but they are quickly gaining in popularity. This is their newest 2-stage mattress. It is Greenguard Certified for low VOC emissions, made in the U.S., 100% recyclable, extremely lightweight (about the same as the Colgate), 6" thickness, seamless edges for easy cleaning, and a waterproof cover. Instead of coils or a foam core, this uses honeycomb-shaped batting inside, making it a truly breathable mattress. And the Greenguard Certification is compelling, requiring minimal VOC emissions. In our tests, the infant side was nice and firm, and the toddler mattress side was much softer. The corners are almost squared, somewhere between a rounded and squared edge; it fits nicely in our test (DaVinci) crib. Given the rounded edges, there might be more risk of losing/dropping pacifiers into the corners. The Lullaby Earth mattress was very lightweight, maybe a few ounces less than the Colgate even, so changing sheets was a breeze. The cover was a good material (non vinyl), and it was easy to clean and had a nice seamless edge around the corners. It does seem well constructed, and their 2016 model had great durability ratings. Cons? Well, not many, but it doesn't have the nicely squared off corners, it sags a bit at the edges under weight (like a toddler standing on it) due to no border rod support, and it was a bit crunchy/creaky when we pushed on it. That last issue is likely solved by a good mattress pad, which we highly recommend using on any mattress. Interested? You can check out this Lullaby Earth Crib Mattress here. You'll also notice a less expensive $170 option without the dual firmness. 9. 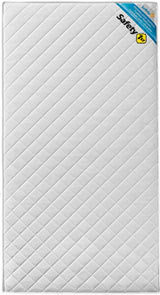 Simmons Kids BeautyRest Crib Mattress. This is a beast of a crib mattress, but we like it quite a lot. It's a more traditional style mattress, with rounded corners, metal vents on the sides, and an ungodly weight of 26 pounds! That said, this mattress meets a lot of our criteria for a good dual firmness mattress. It has a very supportive and high-quality coil core, a nice firm infant side and soft toddler mattress side, vents for preventing odors, Greenguard and CertiPUR-US certification for low VOC emissions, and a great build quality and track record for longevity. When we got this mattress delivered for testing, we saw the UPS man lugging it to our front door and it looked pretty heavy. Turns out metal springs are a bit heavier than foam - go figure! It's a bit of a pain to change sheets on, and it has rounded corners, and those are our two biggest criticisms and why this is lower on our list. Simmons Kids has also however made one of the cheapest crib mattresses on our list while meeting stringent emissions standards, so those are some great benefits. In our testing it fit very snugly in the test crib (DaVinci), and we really thought the firmness of the infant side and softness of the toddler side were a great ratio. Soft yet still supportive, to get some Simmon Kids beautysleep and wake up feeling great! On the downside, the mattress was definitely the smelly one of the group, which was surprising because it's a woven fabric cover (not vinyl), but maybe what we're smelling is the polyurethane foam on the toddler side; that said, the odor wasn't particularly bad but definitely noticeable relative to the organic options above. Update: after about 6 months of using our test mattress, a few places on the outer seam have ripped open to expose the inside of the mattress. We've looked around online to see whether ours was an anomaly, but it seems like this is a relatively common issue. So this mattress is a nice, traditional option that will likely last your family for many years (assuming you get no tearing at the seams), through many babies and toddlers, and we definitely think it's a good and (relatively) inexpensive option. Overall, we think this is a good deal for a coil core mattress with low VOC emissions. 10. 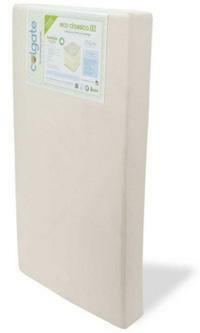 Milliard Hypoallergenic Crib Mattress. This is definitely one of the best bang-for-the-buck crib mattresses on the market this year. Part of the Milliard series of crib and toddler bed mattresses, this is a good quality memory foam crib mattress that performed pretty well in our testing. 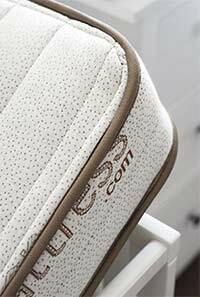 Before you ask, the foam core of this mattress is CertiPUR-US® certified, which means that it is made without ozone depleting products, does not use PBDE, TDCPP, or TCEP flame retardants, does not contain mercury, lead, or other heavy metals, is made without formaldehyde or phthalates, and has low VOC emissions. As you know, these are basically essentials nowadays for any crib mattress - no parents want to be exposing their children to these harmful manufacturing byproducts. The mattress arrived at our business all rolled up in a super compact package about the size of a rolled-up sleeping bag. Once you unwrap it, it automatically unrolls itself and takes shape into a crib mattress. But it's important to realize that it will take a couple days for the mattress to fully take shape, so order ahead of time! It had only a mild "new foam" smell, which was reassuring, and after it was completely unrolled it was pretty firm and supportive, a great level of support for an infant. We're beginning to really like these "memory foam" crib mattresses, and are considering getting one for our own beds! The mattress includes a cover for the top and sides that is a bit like a sheet but actually waterproof, hypoallergenic, and we found it super easy to clean. We actually ended up using it with an additional mattress pad and bamboo fitted crib sheet since the included cover is not super soft to the touch. 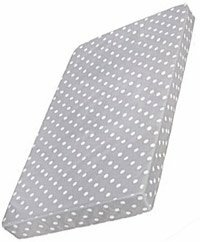 It's more of a protective cover than something that you want to be removing and washing all the time, and if you don't put an additional pad on it, you will be able to see the polka dots right through most crib sheets! The cover does help prevent any spills damaging the mattress, and additionally protects against mold, mildew, dust mites, and other allergens. The mattress fit nicely in the crib, like all of the mattresses on this list, and has nice 90-degree edges to fill in those crib corners. So mostly great things to say about this mattress. It's not reversible dual-firmness for varied support levels, it's not as thick as most others on this list (only 5" whereas most others are just under the 6" requirement), and it's not quite as comfortable as the others above, but overall, we must say that it's a fantastic deal at around $55. 11. 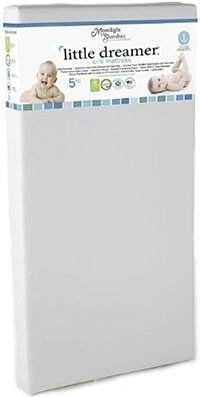 Graco Premium Foam Crib Mattress. This is another inexpensive crib mattress that definitely has some decent bang-for-the-buck, coming in at around $60. We are not a huge fan of foam core crib mattresses given the odor (off-gassing) and the VOC content of polyurethane foam. While this foam does not contain phthalates or lead, it is a petroleum-based material that emits volatile organic compounds (VOCs) that are associated with respiratory problems and skin irritation. And this mattress does not make any claims about its manufacturing process, which flame retardants are used, and what the levels of VOC are when new and after some usage. So no Greenguard or CertiPur certification for this crib mattress, as you might have expected. Out of the box, it did have a pretty strong foam smell which is to be expected. It comes completely rolled up in a bag, and after unrolling it we allowed it to off-gas and rise into form over the course of 3 days (Graco says let it sit for 72 hours to rise completely). This did help with the off-gassing, and the mattress did generally rise into its full shape over the course of the 3 days. But it did have some mushy spots that hadn't risen entirely, especially the end that was in the center of the rolled up core - we had to do some fluffing of it over the course of several hours to make it completely rise into its intended shape and size. After the 3 days, the odor was nearly gone, and after an additional day of manipulating, fluffing and pulling at the mattress, it had risen into shape. We were surprised how firm and supportive it was once it gained its shape, though to be completely transparent ours never actually made it to the claimed 5" thickness, more like 4". Note that we were surprised how firm it got, and that it's probably most suitable for infants up to about 10-12 months old, at which point they (and you!) will likely want a softer mattress. We did like the squared corners that fit perfectly into our Da Vinci test crib without any gaps. It has a washable zippered fabric cover and we had to add a waterproof crib protector onto it to prevent damaging the foam with any liquids. Overall, the fit and finish aren't so great on this crib mattress, the zipper pull and zipper itself seem a little flimsy, and it's unfortunate that the cover isn't waterproof. So if we could choose between the two cheapest crib mattresses on this list, the Milliard (above) or this Graco, we would definitely go with the Milliard. 12. 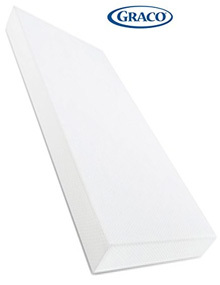 Sealy Soybean Foam Core Crib Mattress. 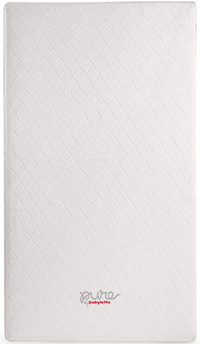 To be honest, we were lured in by the advertising on this Sealy Soybean hypoallergenic crib mattress, with its use of a soybean foam core, its hypoallergenic claims, and its GreenGuard (low emissions) and CertiPUR-US (polyurethane foam made without several harmful chemicals) certifications. These are all great claims and features, and the mattress itself has a lot going for it. First, we found it nice and firm but with a soft but not organic cotton upper layer that keeps things plush enough for reasonably comfortable sleeping (at least for a newborn and young infant). Second, we appreciated the waterproof cover so that you don't need to buy a separate one to protect the mattress. Third, we liked how the mattress appears to have a ventilation layer to help airflow and prevent moisture from being locked inside of the mattress. Fourth, we thought it fit our test cribs quite well with its angular corners. There are a lot of positives with this mattress, not the least of which is the relatively low price. However, we also found some cons. In reading the label, they state that the soy core is a polyurethane foam; so that suggests a little bit of soybean is being used in making the foam, perhaps just enough to be able to accurately claim that in the marketing materials. But we do appreciate the CertiPUR certification for the foam manufacturing, which gives us confidence that there are no heavy metals, CFCs, harsh flame retardants, formaldehyde, or BPA, and it is low emissions. So that's all good, though we do think the marketing is a bit misleading. We also found the mattress to be very firm, and we mean VERY firm. Meaning that your baby will likely outgrow the mattress by about a year, and you'll be wishing you had purchased a double-firmness mattress! Some of our reviewers also reported that over time this mattress tends to sag quite a bit in the center, and they suggested flipping it over every couple of months. Finally, we didn't like the vinyl laminate cover. While that does make it waterproof, it also increases the likelihood that the cover also contains several harmful chemicals, such as phthalates (which increase their emissions in warm conditions). So overall there are some positives with the Sealy Soybean mattress, but we think most of them are at least partially negated by the cons. But if you're looking for a super firm soy foam mattress with some great characteristics, and a low price, this could be a good crib mattress for you! Size: Standard crib mattresses should measure approximately 27.5" wide (this varies about .25" between brands and versions), 52" long, and about 5-6" thick. This is the standard mattress size for baby cribs, and is not to be confused with the smaller sizes necessary for playards (check out the best travel cribs) or bassinets (check out the best bassinets). By law, a crib mattress must be at least 27.25" wide and 51.625" long, and a maximum of 6" thick. Thicker mattresses are not allowed given the risk for a standing baby to climb and fall out of the crib. Crib and toddler are not always a great combination, so be sure to lower the mattress down when they turn into a little monkey! Always consider sleeping safety when you're setting up your crib. Corners: You will notice that some mattresses for sale have rounded corners, and some have squared corners. About 99% of all cribs have squared corners, so a squared corner mattress tends to fit much better without gaps. Gaps in the corners aren't a huge concern, but they can be an annoying place for pacifiers or lovies to fall and get lost. A mattress with squared corners prevents these issues. Dual Firmness: Pediatricians suggest that infants sleep on relatively firm mattresses until they are mobile (sitting, rolling, and pulling themselves up to stand in the crib). This usually occurs around 9-12 months. Many mattresses are made with dual firmness. The firm side is used for infants until around 9-12 months, and then you flip it over to the softer toddler mattress side. These dual firmness mattresses tend to be a bit more expensive than single firmness, but it's definitely worth the extra money since you won't have to buy a new mattress after 9 months. When new parents first feel a high-quality recommended mattress, they think "wow this is too firm for my little baby!" but that's exactly what you want. Firm mattresses reduce the risk of SIDS and facilitate learning to roll and move around. If you push your hand into a mattress at the store and your hand sinks in and the mattress maintains the indentation of your hand (like a memory foam), it's probably not a good option. If you push your hand into a mattress with a coil core, you'll feel that it's nice and firm and supportive. The toddler side will add extra foam cushion on top of that firmness, but only after your baby knows how to roll, sit, and stand. So we definitely suggest a dual firmness crib mattress. Outside of that, the other option is the Newton Wovenaire Crib Mattress, which uses an innovative design with a firmness level appropriate for both infants and toddlers (we review it up above). Price: It's rare that you will find a crib and toddler mattress or baby mattress combination, instead most people purchase them separately to make sure they can get the exact style convertible crib they love, and the mattress that makes sense for their needs and budget. You can certainly purchase a pretty inexpensive crib mattress, but they tend not to convert from infant to toddler crib mattresses (i.e., they tend not to be dual-sided), tend to have VOC emissions, and are made with questionable materials. In our opinion, it is worth splurging a bit for a high-quality crib mattress, since you will very likely be using it for a few years (and for a second child!). Expect to pay from $200-300 for the best baby mattresses out there, but be sure to check out the Milliard mattress, which is blowing away the rest crib competition with their $55 mattress! Emissions Standards: Mattress manufacturers have done a good job of modifying their industry standards to increase indoor air quality and reduce infants' inhalation of harmful VOCs. There are a number of environmental institutes and committees that provide private certification for mattresses. The major one is GreenGuard Certification. If you see this label, you can rest assured that the mattress conforms to relatively stringent VOC emissions standards. You can also go even further and invest in an organic crib mattress, which will usually be certified by the Global Organic Textile Standard (GOTS), or Oregon Tilth. If you decide to go with Organic, go all the way. A mattress labeled as "certified organic" will be made of at least 95% organic materials. A mattress labeled as "made with certified organic materials" will likely have a much lower organic content mixed with less expensive synthetic materials (like a vinyl top cover). That little "made with" statement is tricky because it could mean that the mattress was made with 2% organic, or 90% organic, and it's difficult to determine the actual numbers. If you do choose a mattress that uses a polyurethane foam core, we recommend compliance with CertiPUR-US, which ensures low VOC emissions (less than 0.5 parts per million), and zero formaldehyde, heavy metals, chlorofluorocarbons, or regulated phthalates. Of course, the higher the manufacturing standards, the higher it is to actually make the mattress; so many you can dig up some gift cards from your baby shower and use them to lower the cost! Venting: High-quality crib mattresses have little vents (usually plastic or metal grommets or slits) along the side to help the mattress "breath." It may seem silly, but these little vents will help keep the mattress from absorbing various smells from your baby, like a dirty diaper smell lasting for several weeks! Combine that with a good crib mattress pad and you can keep odors at bay for a long time! Longevity: One of the reasons we compare products like crib mattresses is to give you not only the short-term test, but also the long-term reliability evaluation. If you plan on having more than one kid, or there's some chance that might happen, then we recommend getting a high-quality mattress that will outlast your baby's time in a crib. The less expensive models lack certain features like border rods that prevent edge sagging and use cheap materials like thin vinyl covers that dry out and crack within a few years. In our opinion, spend the extra $50-100 and get a good quality mattress that will last your family many years. Most crib mattresses can also be used in the crib and toddler bed, so if you're purchasing a 3in1 or 4in1 convertible crib, then when you convert it to a toddler bed you will be able to continue using the same mattress just as a toddler bed mattress. It's a great way to save some cash by not having to purchase a separate toddler bed and mattress.